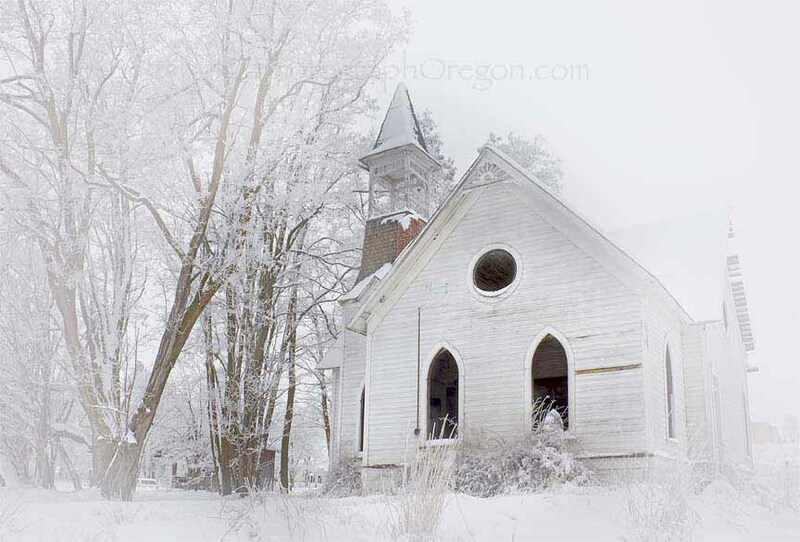 There are many abandoned Oregon churches. Most have little information available on them, as all the people who knew about them are gone. They sit on roadsides all over Oregon in various stages of decomposition. They fascinate us and we love them all! 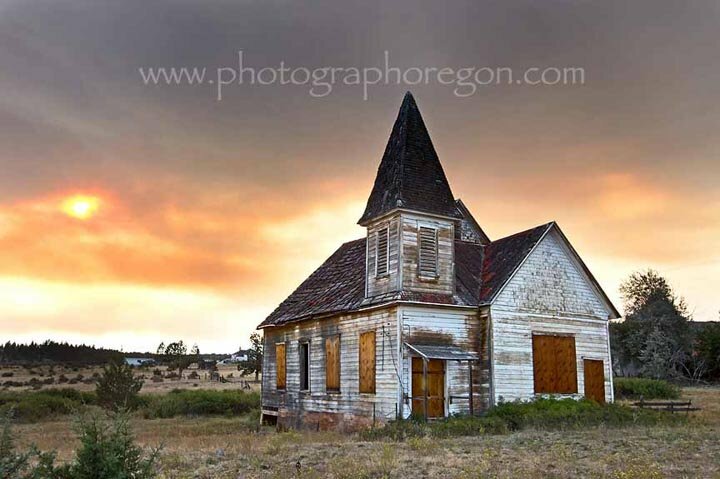 This, without a doubt, is the most photographed of the abandoned Oregon churches. 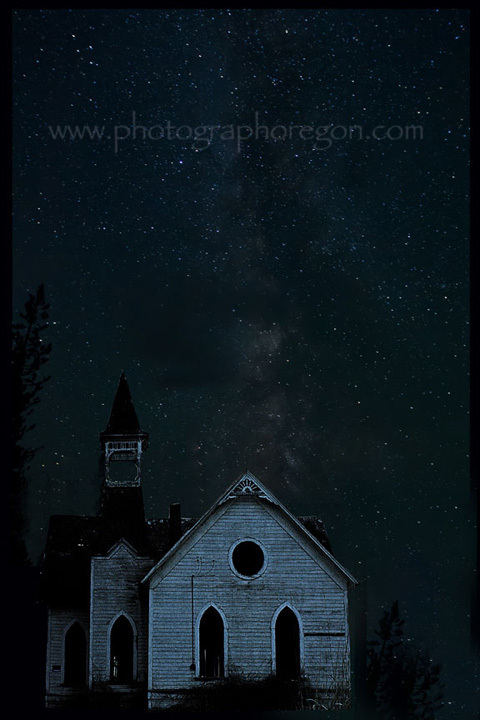 For me it is the second most photographed church as my congregation is super accommodating about me documenting my church, an active Oregon church, Trinity Episcopal, Bend, in all seasons. I was with a friend on my way home from Cove, OR. On the way out I had seen a barn I wanted to photograph but the light was harsh and I decided to wait until the trip home as I knew we were coming in near sunset when the long light would be awesome. Deby was driving and I was diligently scouting the other side of the road for the barn, when I happened to look the other way…..and screamed STOPPPPPPPPPPPPP. (Deby is a GREAT sport). 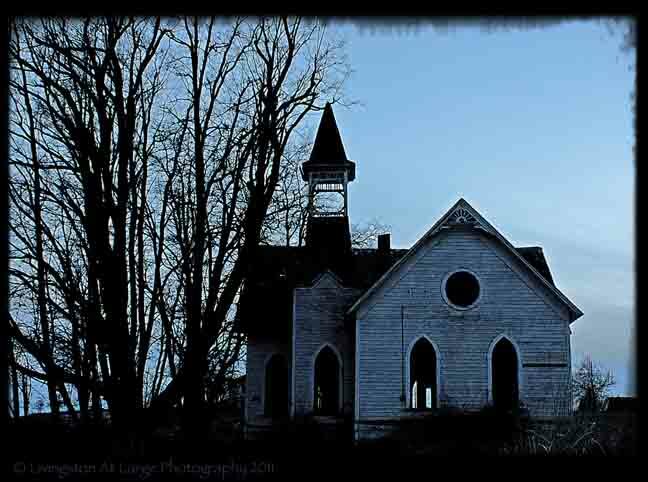 That church took my breath away. I didn’t know at the time it’s status as most photographed church. 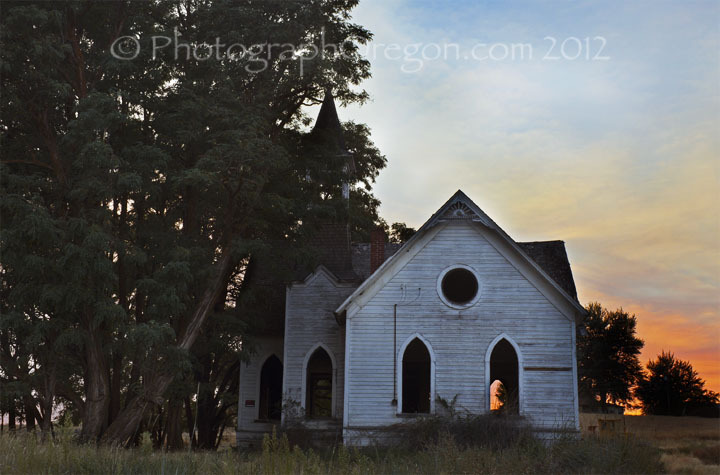 I just knew it was way a cool abandoned Oregon church. This was what I saw in the twilight. We had missed sunset but the twilight was accommodating. A few weeks later I had the chance to go back in the daylight with another friend……and really, the floor didn’t look so great. . I suppose it is an advantage to have non-photographer friends with common sense along. 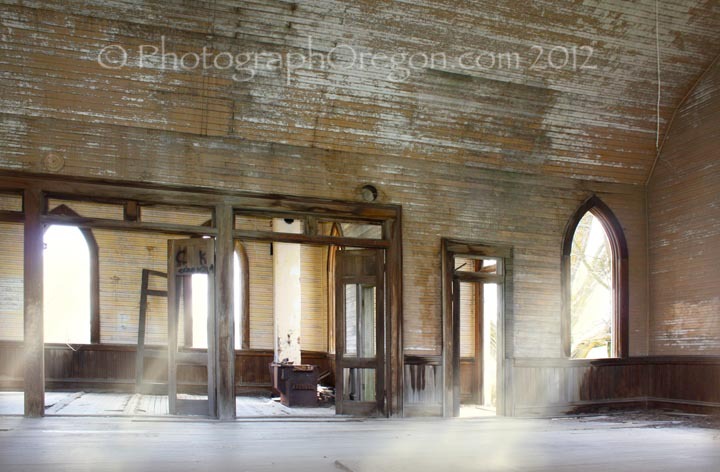 Since then I’ve been back to my favorite abandoned Oregon church several times and it never, ever gets old. (Well…it does get “older” but you know what I mean.) Now my goal is to catch it in snow. Last year any time I thought it might have snowed there I called some place in town. 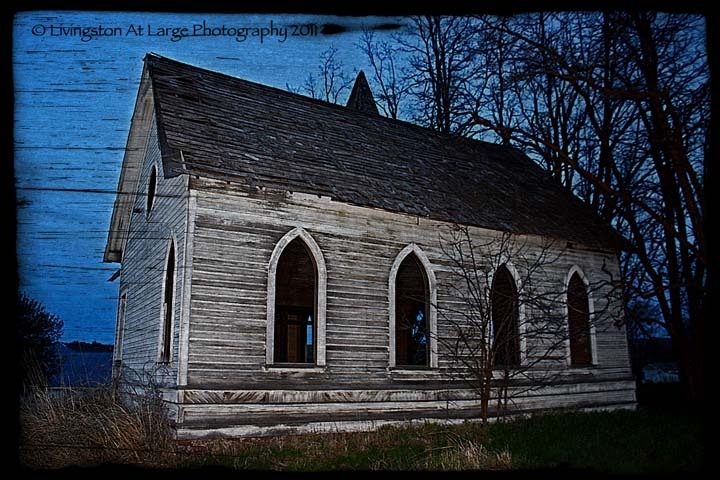 The Catholic church, the store, the gas station…I alternated so they wouldn’t catch on. 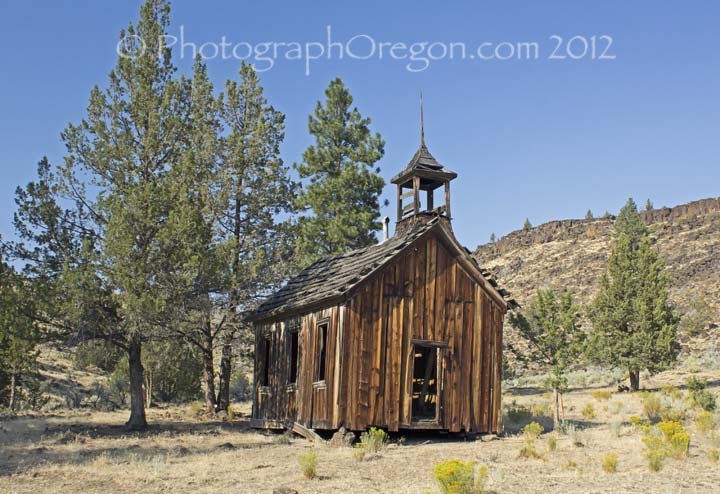 The Grass Valley Methodist Church was built possibly the 1880s into the early 1900s. in Grass Valley, Oregon. This is the extent of available information about it’s construction. ...and I did finally catch a sunset. 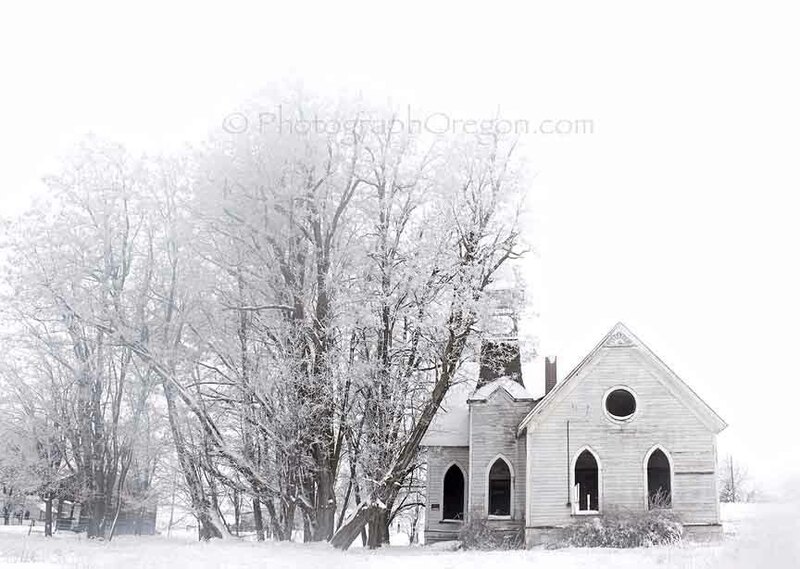 One of the things high on my bucket list was to capture this church in snow and frost, which happens so rarely and the church is 130 miles away that it really was a big goal. 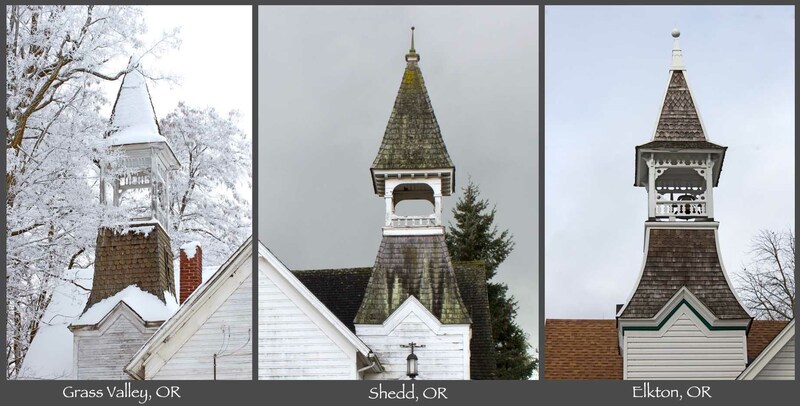 I also feel I am getting a little closer to finding who designed this church, as I've found two more churches in different parts of Oregon with very similar steeple features. Grass Valley is located approx 65 miles from Madras on Highway 97. The church is on 2nd st where Union st. dead ends. Really, once you look west from the highway, you can’t miss it. Your heart will leap in your throat and your camera will start hopping around in the bag. 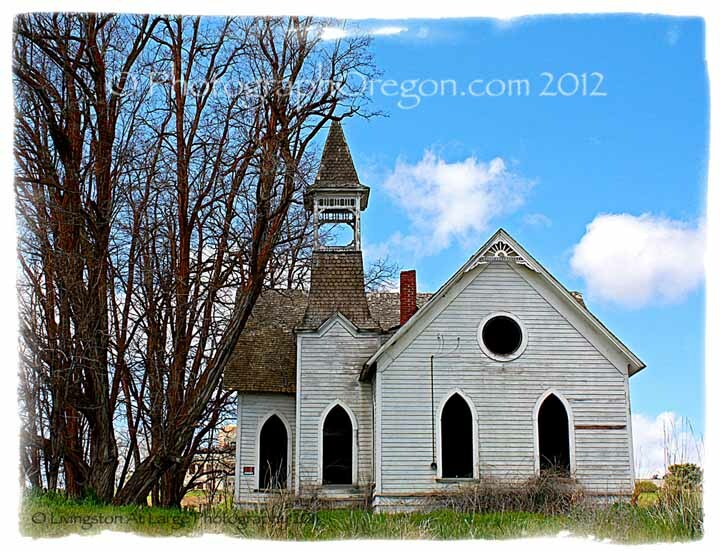 This Presbyterian Mission church, another well known abandoned Oregon church, has not been used since the mid-1960's. There is little to no information on it. I had seen pictures and heard about it so one day when we planned to do some night star shooting at the Balancing Rocks, we planned a whole day trip and the Simnahso Church was on the list. It happened that a large wildfire had broken out that morning west near the Metolilous River and gave a spectacular background as the sun was going down. 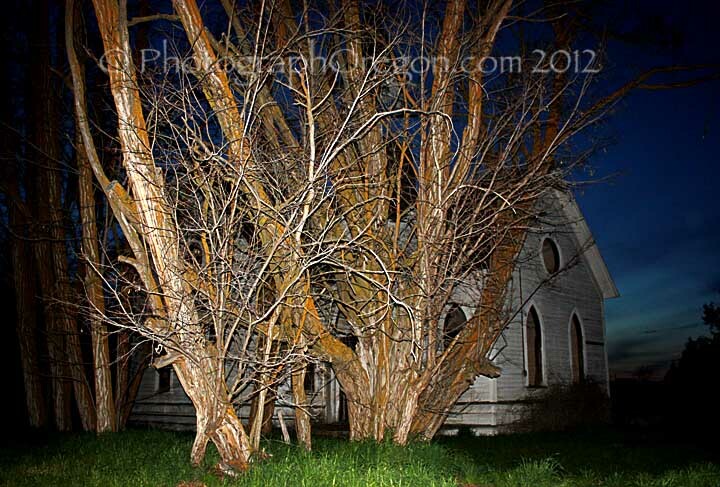 This church stands at the junction of Simnasho Rd and Hwy 3 (Wapanita Rd). You can either go off Highway 26 on to highway 3 and up, or you can go off Highway 97 east on Simnasho Rd. I was nosing around the reservation looking for cool stuff, (Which I advise you not to do as they are pretty staunch about their privacy and I got the grouchy faces from most everyone I asked and some stern warnings about trespassing, which amazingly I was not doing at the time :) but a kind young man at the museum turned me on to this little gem of the abandoned Oregon churches. I know nothing about it except where it is. Notice the rocks holding up each corner. Please, please, PLEASE do not go inside it or wander off the road onto private property. No snooping around near people’s houses either. Off highway 26 just after you cross the river coming in to town, turn off on Jackson Trail Rd right before the Eagle Crossing restaurant. Head out along the river 8-10 miles (I don’t quite remember) and you’ll see it on your right. Really, you can’t miss it. If you don’t see it, you didn’t go far enough.